As I stood at the checkout counter at our local Home Depot store, my husband pulled out his wallet producing his military ID. “Can I get a military discount?” he asked. “Thank you for your service” and entered the code that gave us 10 percent off our entire purchase. I stood there beaming with pride. Anytime I hear someone thank my husband for his service, I fight back the tears for many reasons, none of them because I saved 20.00 off my purchase. The tears come because, for the most part, our country has learned from their mistakes and readily shows their appreciation for those who serve. Not that long ago service members came home being shunned, spit on, and bullied for fighting a war they may not have believed in or understood, but they did believe in supporting their country. The tears come because my husband is part of an elite group of men and women who chose to serve others sacrificially. By volunteering to defend their country, they often miss the birth of children, anniversaries, holidays and family vacations. The tears come because I stood behind my husband for 20 years as he made a career standing for the freedom of others and a country he believes in. But that day, we received our military discount, I cried for another reason. His reply reached deep into my heart. Yep. The tears came then too. Until that moment, no one had looked past my retired sailor and seen who was standing in his shadow. If I am honest, I never did either. But that day, the day someone saw me as an integral part of my husband’s 20-year career, I realized how important it is to remember the spouses of our military men and women. Things You May Not Know About the Military Shadow. While our spouses are out fighting for freedom, we are fighting our own battles at home. We are raising smaller shadows — our military kids. There are days when your feet hit the floor and you can’t wait to tuck them back in bed later that night. Raising my four children, mostly alone, had its challenges especially on the days all they wanted was their Dad. But we pull up our bootstraps and do the best we can to keep the kids connected to their missing hero, by spending a few nights a week drawing pictures, creating videos and writing letters. We can MacGyver appliances and other things. It never fails when your sailor is out to sea for months on end, things are going to breakdown. The show MacGyver became a great resource for me. I learned how to ‘fix’ my washing machine lid switch with a bobby pin and electric tape. I taught myself to use my husband’s band saw, and scroll saw to create Christmas gifts for teachers. I re-wired a phone jack in our apartment. And I was even able to turn a VHS tape player into a boat anchor by not unplugging the player before I took it apart to get a stuck tape out. Note to self….. little tiny screws falling on a circuit board creates fire! We are preparing for the next big move. Any move is a big deal in a military families life. Whether you move across the country or down the street into a base housing unit that has more bedrooms, we are ideal packers and organizers. But the reality is not everything comes out of the boxes. Some things, stay tucked safely away until you are on the other side of your military career. Why unpack them only to re-pack them a couple of years later? We are great at counting. We count down the days until our military spouse leaves for their next deployment and create lists of things that must be done before they ship out. We count down the days until they come home too. 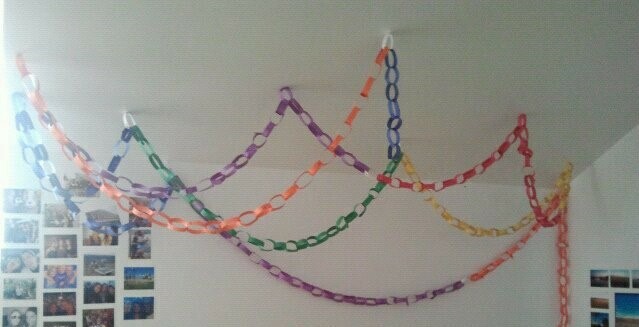 One of the biggest things I did for the kids, was making a six-month deployment paper chain. Each night before bed, one of the children would take a link off the chain, announcing to all of us, we were one day closer to Daddy’s return. We are always praying for the best, but secretly planning for the worst. Prayer gets us through one day at a time. We pray when we go to the mailbox, hoping for a letter. We pray for a phone call when the ship reaches port after sailing for weeks at a time. We pray for the finances to pay for that phone call when the bill comes in. Because as hard as we try to say “no overseas phone calls” because the budget has no wiggle room and we can’t afford it, the real truth is, emotionally we can’t afford NOT to hear that voice on the other end of the line. We pray for the safety of all crew members, knowing that just because we aren’t in a war, there are still many dangers that could bring harm and sadly even death while our military member is deployed. While this post is not meant to take away from the military member and the sacrifices they make for our country, it is my hope everyone will see some of the other sacrifices going on in the shadows, much like the cashier at Home Depot did with me. So next time you thank a military member for their service, be sure to look behind him and thank their spouse too. They have given sacrificially for the freedom of others as well.